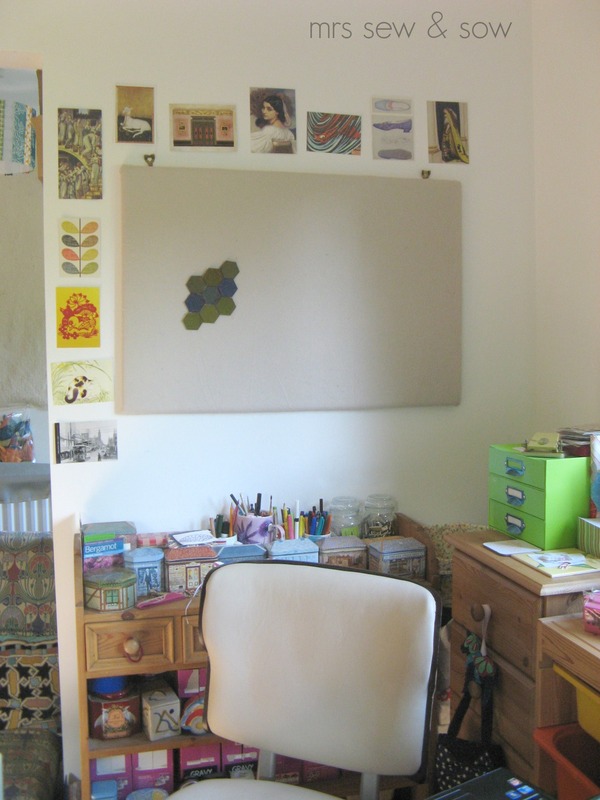 I have shown you round before but I'll be joining up with the Studio Spotlight - so I have tidied and cleaned and organised and hope it doesn't look too shabby! My sewing room used to be the kid's playroom and I was using the spare bedroom but after many threats to take it away if they didn't keep it clean I actually went ahead and chucked my naughty children out! And this is the oasis where I sew, blog and do whatever else I fancy - this is my room! Open the door and in we go! This is the small design board I use to piece blocks - it is swivel distance away from my chair! 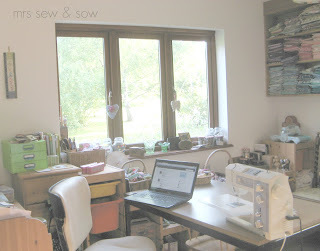 And this is where I sew and blog! I can look out the window or up to my colourful stash! 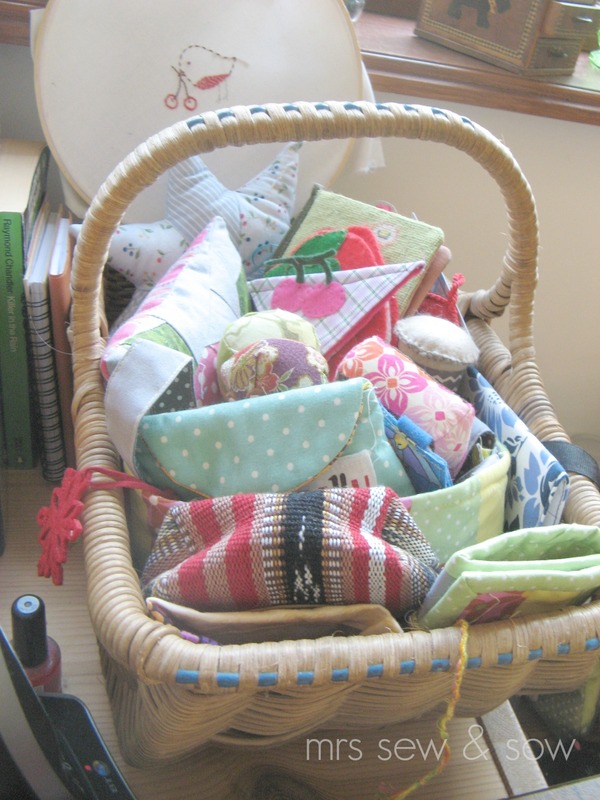 And more pincushions, and sewing kit close by - hi Mary, Janet, Rhonda and Irene! 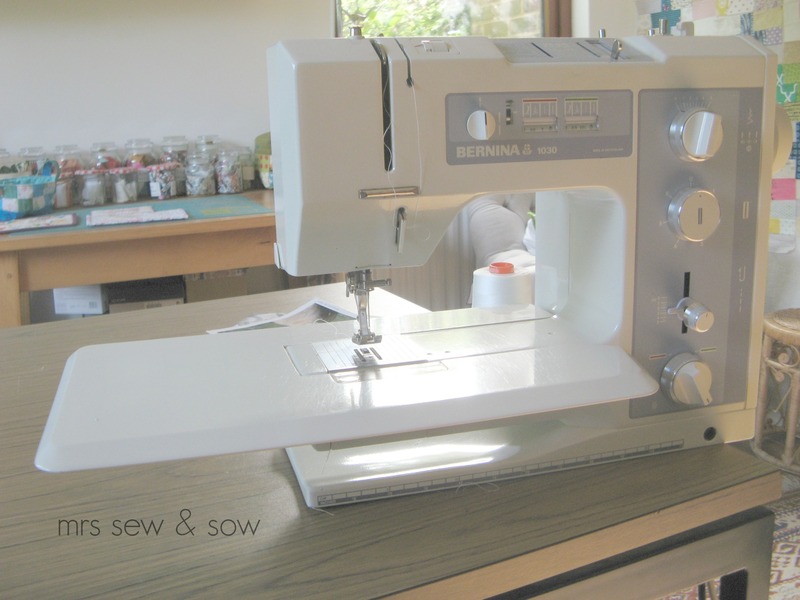 This is my trusty Bernina! Nowhere near the latest model but the machine I piece, embroider, applique and FMQ on! Now under the window I store stuff in vintage baskets! Each basket seems to have a buddy! The owl in the first guards vintage sheets etc, the bear in the second looks after my basket sampler UFO. The next basket holds scraps at the moment and a bear that came from Emily! The little mole comes from the Czech Republic and accompanied a gorgeous block from Di. And there you see just part of my basket collection! The next set of photos are what I look at when I sit at my sewing table! My cutting table lies below my stash, my comfy chair with my precision made cushion from Helen sits below this thirties china - you see I'm ready to serve you tea when you drop by! And all this is at right angles to one design wall with my offset crosses on it from my Stingy Bee mates ! Hiya girls! That door is a double cupboard full of quilty goodness and other stuff - bit of a black hole in there and so not show worthy! Now we see the door we came in through - a sneaky little design wall there usually seen through the glazing on the door which is usually open wide! Immediately round the corner are two heavily laden sets of shelves - struggling to cope with a large collection of craft books and quilts and tote bags! And then onto my other big design wall - with a recent project - the big hexy balls! And last but not least a chair just behind me near the table - with it's sometimes occupant! None other than the gorgeous Maddie! Hello pup! Hope you enjoyed the tour! Next time I may even let you in that cupboard! You have a great space there. Yeah for Berninas. Love your baskets Nicky, so tidy too! 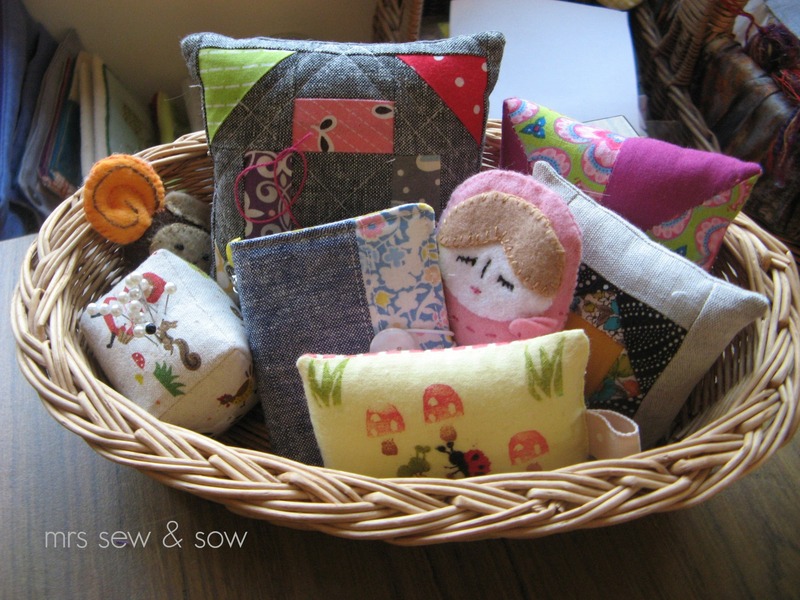 We are rearranging our rooms in the next week and, fingers crossed, I will end up with a sewing room all to myself! Can't wait. Nicky! I so enjoyed this tour! I must say, though, I'm shocked your walls aren't painted green :) I love that you have little bits of your friends peeking out of baskets. What a great idea. 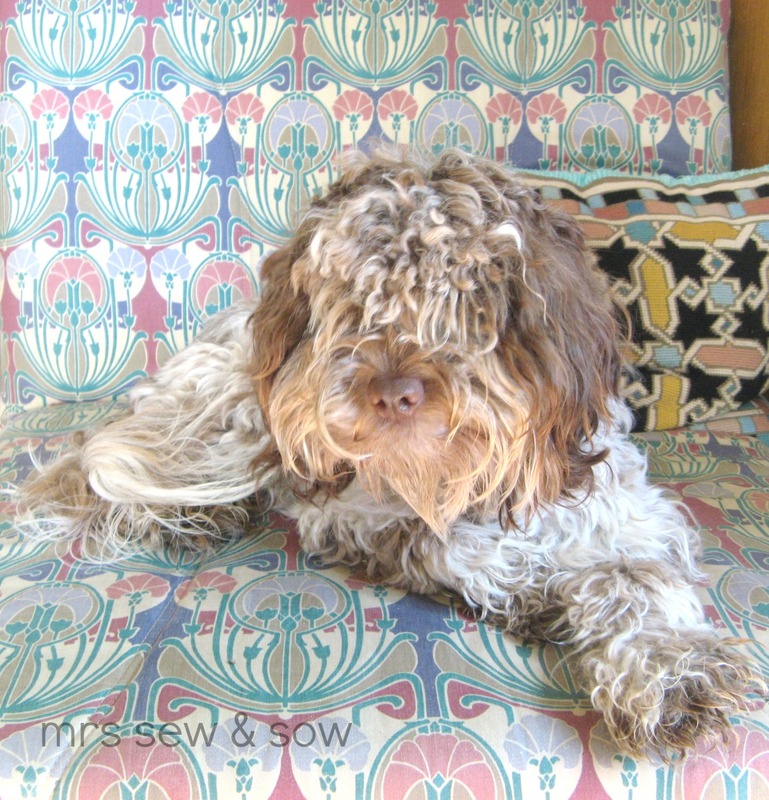 I love that you have a comfy chair for you and another one for Maddie, she's gorgeous! I wish I was half that tidy! Looks a lovely space in which to get creative! Wow, now that's a proper sewing space. My sewing space is more like the cupboard. But at least it has a door to keep the kids out ha ha! 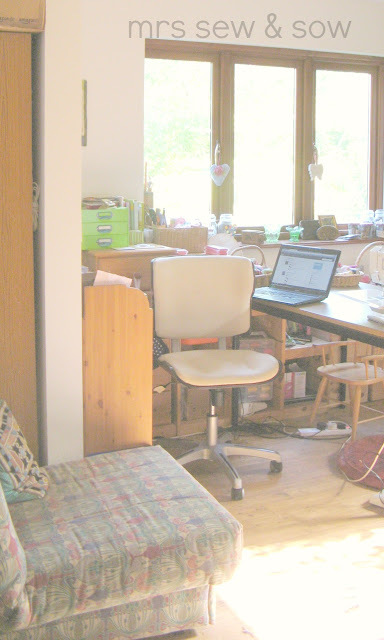 Thanks for sharing, what a lovely bright room - perfect for inspiration! S glad you tidied up r my blocks might have been lost forever. Hi Maddie!! What a nice sewing space! You have lots of natural light! Looking lovely (no surprise there!) love how there are bits from lots of your friends there too, that's one of my fave things about my space too. you have a LOT of design walls!!!!! 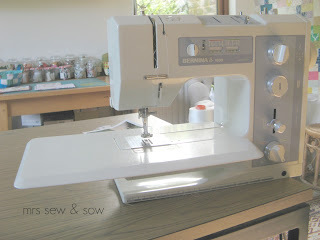 I think you have a lovely space, the perfect environment for sewing! i have sewing room envy! What a nice studio. I bet the children pick up in their rooms now. lol And look, you got such a great space....now that really is a win-win! Thanks for the tour - your sewing room looks wonderful, no wonder you want to spend so much time in there!! P.S. Maddie's such a cutie! what a great room, much better use for you than for the kids! Your sewing room looks great. It's wonderful to be able to sit in one place and see everything and I love your vintage baskets! I also love how you threw your children out for not keeping it tidy! Oh, now just look at this fabulous creative space! I think I would never want to leave this room, Nicky. It's bright, inviting (love those cherished pieces from friends) and comfy looking (can I share the perch with the pooch? ;o). Perfect! WIP Wednesday or should that be Thursday? Startitis - The coping mechanism! Stamp it up! Swap - wanna play?